Mega-selling creator of Horrid Henry, Francesca Simon and Lauren Child, acclaimed author of the Ruby Redfort and Clarice Bean books, have joined forces for this year’s World Book Day to find the UK and Ireland's Storytelling Superstar for 2013. The pair, who have kept millions of youngsters entertained and delighted with their stories, are now on the hunt for children, mums, dads, siblings, grandparents, babysitters, teachers, booksellers or librarians – or anyone else – who make reading aloud thrilling and fun for a young audience. Francesca and Lauren are urging people to submit videos of the most skilled and passionate storytellers in action. It’s simple to take part – just visit the special Storytelling Superstar page at www.worldbookday.com and follow the instructions to send in or upload a short clip of yourself or your nominee performing an extract from a favourite children’s book. Entries close on Monday 11 February. The winner will be the person who shows the special panel of judges that they can bring stories to life in the most imaginative ways – from acting out characters, putting on different voices and filming in unusual locations, to dressing up and using props or playing games with the words to get others joining in the performance. 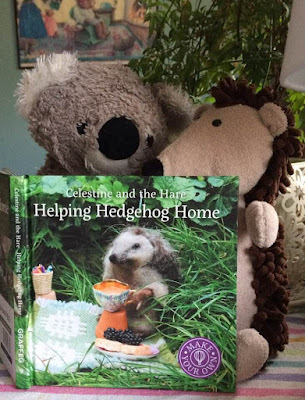 Francesca Simon said, “All children love being told a story, and a good storyteller can really bring characters to life and transport his or her listeners into a different world. Telling stories is a wonderful way of stimulating children's imaginations, helping them to understand themselves and others and to become avid readers." The 2013 Storytelling Superstar will be unveiled to the nation on World Book Day (7 March) and receive a year’s worth of children’s books from National Book Tokens*. Francesca and Lauren will be joined on the judging panel by The Reading Agency’s Chief Executive, Miranda McKearney, OBE. She said, “Children who love reading have a better chance in life, so inspiring them to love stories is really important. I’m delighted to be helping recognise the Storytelling Superstars who are doing that inspirational work, at home and in the community. School children are entitled to receive a World Book Day £1 Book Token (or equivalent €1.50 Book Token in Ireland) which can be exchanged for one of eight specially published World Book Day £1 Books, including Alfie’s Shop by Shirley Hughes, The Diamond Brothers in… Two of Diamonds by Anthony Horowitz and The Chocolate Box Girls: Bittersweet by Cathy Cassidy – as well as new titles from Francesca and Lauren**. Older readers will meanwhile be able to access exclusive new digital-only content from popular teen writers via a brand new app for iOS and Android powered by teen social reading and writing community, Movellas. Notes to Editors *Prize is equivalent to £250 National Book Tokens (maximum). About World Book Day World Book Day was designated by UNESCO as a worldwide celebration of books and reading, and is marked in over 100 countries around the globe. World Book Day is a partnership of publishers, booksellers and interested parties who work together to promote books and reading for the personal enrichment and enjoyment of all. A main aim of World Book Day in the UK and Ireland is to encourage children to explore the pleasures of books and reading by providing them with the opportunity to have a book of their own. World Book Day is sponsored by National Book Tokens. To mark the day, school children are entitled to receive a World Book Day £1 Book Token (or equivalent €1.50 Book Token in Ireland). The £1 Book Token can be exchanged for one of eight specially published World Book Day £1 Books, or is redeemable against any book or audio book of their choice costing £2.99 or more at a participating bookshop or book club. 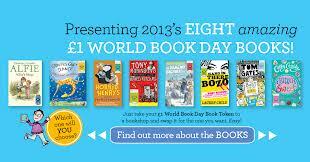 The World Book Day £1 Book Token will be valid from 25 February to 24 March 2013. Yes, World Book Day 2013 will soon be with us.. I'm sure you've heard me say this before. World Book Day this year falls on Thursday, March 7th!The planning for the World Book Day Extravaganza 2013 in Dubray Books Galway Branch (which is where you'll find me) is well under way and I'll shortly be sending out the invitations to various school classes throughout Galway City. So, don't worry... you are all on my list and can expect to hear from me soon. And I don't mind saying, I've got some very, very special authors and storytellers offering their time this year, all to bring the wonder and excitement of reading to the kids! If you're not in the Galway area, I'm sure you can expect to hear from your local bookshops and libraries... or perhaps there is even a special celebration taking place in your school! Please note: World Book Day book tokens are only good through Sunday, 24th March. After that, they can no longer be accepted. We're almost through January! I don't know about you, but in my little corner of the world things have been changing thick and fast and heavy. So, it's nice to reflect on some old, old traditions.... while in the US, February 2nd is Groundhog Day, here in Ireland, we celebrate it Brigid's Day. 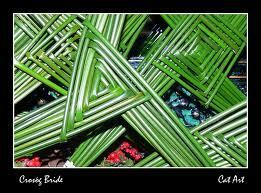 And what Brigid's Day would be complete without Brigid's Crosses to protect and bless us throughout the upcoming year? At the Galway City Museum, on February 2nd, the whole family can partake in a very special workshop. Join Brendan McGowan of Galway City Museum to learn about some of the folklore and traditions associated with St. Brigid and her feast day, and afterwards have a go at making some of the various types of Brigid's crosses. 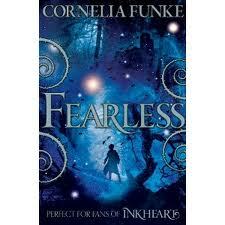 The second book in one of (two) of my favourite 'fairytales' is due out here in just a few days time. 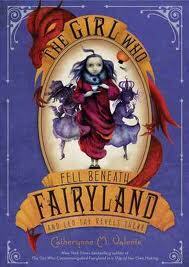 The Girl Who Fell Beneath Fairyland and Led the Revels There by Catherynne Valente is the follow-up to The Girl Who Circumnavigated Fairyland in a Ship of Her Own Making.... and it is just as wonderful as the first. Expect a review in the next few days (so you can read it before it's release date on January 17th). But in the meantime, here's a wonderful trailer from YouTube. Beautiful image I just wanted to share with you all today... it's been going around on Facebook! Be Forewarned! World Book Day 2013 is coming! It's coming, it's coming, it's coming!!!! This year, World Book Day falls on Thursday, 7th March. (But, you know what I'm like. Dubray Books Galway Branch will be celebrating the week of Monday 4th March through Friday 8th March!) So, my first shout out is to all you authors/illustrators and story-tellers who want to come to Galway and help me entertain as many primary school-children as I can safely fit into the shop. If you're up for it, give me a shout.... email, phone call, private message on facebook, carrier pigeon, smoke signals; whatever works best for you. I'll respond with the proposed schedule and we'll book you in! Can't wait!!! But before I get carried away, you'd probably all like to know what the featured books for WBD are this year. (And don't forget, every child should be getting a €1.50 WBD voucher from school, so they can chose their own book... for FREE with the voucher!) Here they are!!!! As per usual... something for absolutely every child at every age level by some of the best childrens' authors writing today! And here's the link for the World Book Day website, where you'll find more about the books, as well as activities, e-newsletter, apps and the registration form (if you are a school)... everything you need to know about World Book Day 2013. Let's make this the biggest and best ever! We have bid a fond farewell to 2012 and are now on the second day of 2013. This year promises much in the way of childrens' books and publishing, and I will do my utmost to keep up with all the excitement and the new titles that will come our way. One of the things that did my heart a world of good this past holiday season were the number of articles in favour of/praising the printed book. In an atmosphere of Kindles and other e-readers, it seems the printed page is still as strong as ever. 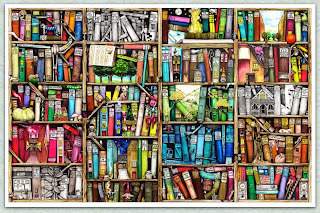 Below is an article by Beth, one of the winners of the Guardians young critics award, exploring the question "Can a Kindle ever take the place of a book?" I'm quoting from Beth here, as she puts very explicitly one of the reasons why I feel the answer to that question is a resounding NO! 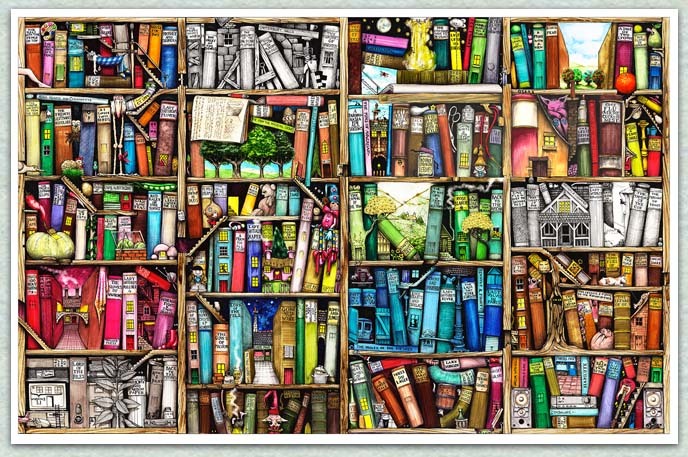 "Books are like humans: each one is unique, they all have their own story to tell. They need a bookshelf just as we need a house. They can be ripped or torn just as we can break a bone. They can become famous like us. They are born and grow old like us. A book is something that is read then laughed or cried about, then stored on a shelf until years later. Then it is taken out to be dusted and exclaimed about as it brings back memories of all the thousands of times you read it as a child. Perhaps it was under the covers with a torch praying your parents wouldn't see the light or out in the garden on a summer's day using the book to shield your eyes from the sun, flicking its pages beneath your nose to get that familiar "booky" smell. Books can be made personal; bent, folded, marked by grubby hands. They can be doodled in and signed by their author at a book shop making a great day out." I hope that you received the books you were hoping for this past Christmas season, or even better (sometimes) a book voucher or token for you to take into your local bookshop and spend time musing over all the titles on offer until you find the one that excites and inspires you; that takes you on unexpected journeys and introduces you to new friends, old acquaintances and gives you new challenges to overcome. 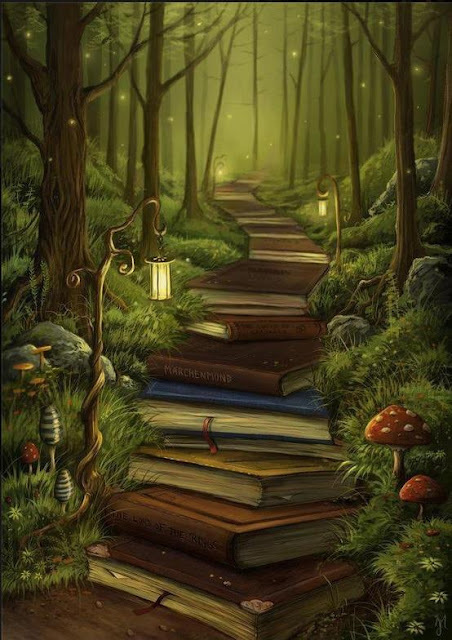 The book that you will put on the shelf until years later, when you will dust it off, reread it, and the journey will be renewed for you, again and again!